*Detailed instructions with pictures are now found on PaleoEdge. Check out the article here! This is an unbelievably rich broth, useful for winter stews and soups, braising meat, helping heal digestive disorders, and for muscle and joint health. Good broth is the cornerstone of many delicious meals and our health. *IF YOU HAVE A VERY SENSITIVE DIGESTIVE TRACT, MAKE THE BROTH WITHOUT GARLIC, LEEKS AND ONIONS DUE TO SULPHUR. Stove: Place bones in the pot with water and apple cider vinegar. Let sit for 30 minutes. Add the rest of the items and bring to a boil. Bring back down to a simmer for about 6-12 hours. Turn off heat and let cool. Strain into 1-2 quart glass jars and place in the refrigerator. Keep the marrow and meat to be added to soups or enjoyed on their own. Once cooled, the fat will rise to the top. Skim this off and discard. The broth can be used for 4-5 days placed in large ziplock bags to freeze. Slow Cooker: Follow the same instructions, except once adding the other items, place on low for 24 hours. Proceed as before. 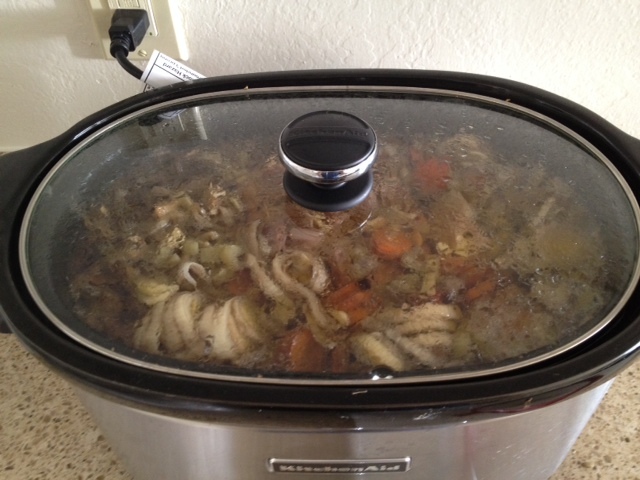 *Alternatively, you can purchase beef broth like this already made!